An understanding of Dungeons and Dragons, board games, and other things geek. 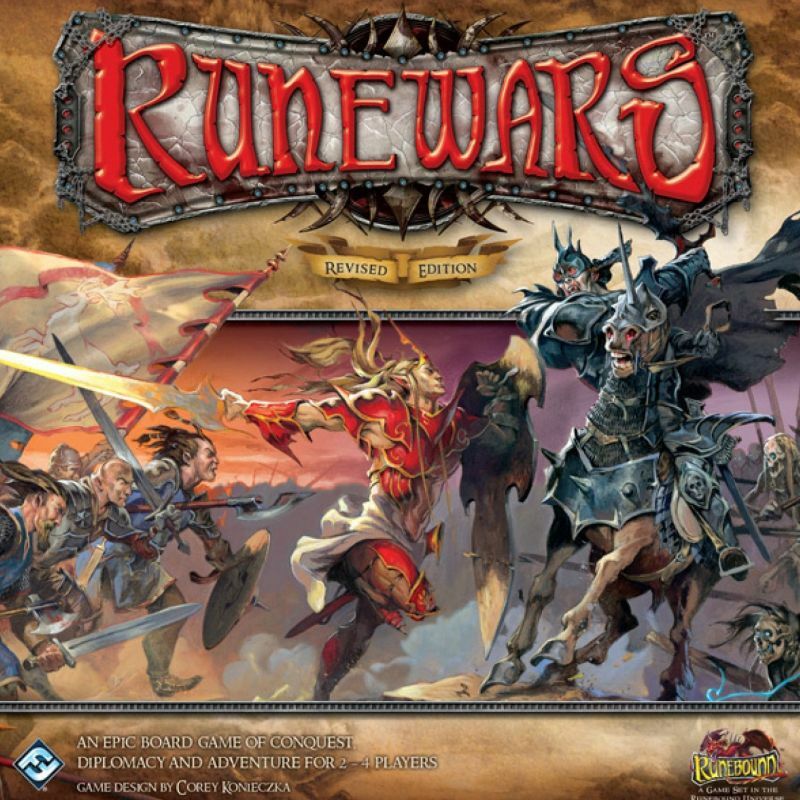 From Fantasy Flight Games, Runewars is a grand strategy conquest games for 2-4 players. Set in it’s own fantasy universe drawn from Terrinoth, the same world as Descent, each player is a race seeking to control several powerful dragon runes. The first person to obtain 6 runes (or have the most by the end of the game) wins. The game plays over 7 years, or rounds, with each year split up into 4 seasons. Every season has a specific event. Spring allows units that retreated or were exhausted in the previous year to ready. Summer has a special hero turn (more on that later) allowing these characters to scout through the lands, begin a quest, or duel other heroes. Autumn allows players to earn influence or tactical cards, while Winter, an especially important season, requires the feeding of your troops. There are stacking limits of 8 units per hex area. At the end of a player’s turn, if there are more than 8 units they must be eliminated. During the winter season each area containing armies from the player must match their food resources (which runs from 0-8). Any hexes containing more units than the player’s food resource value must have troops eliminated until they match. Woe is the player that doesn’t plan out maneuvers and troop movements to account for the bite of winter. In addition to each major event associated with a season, there is a random event. Events somewhat follow a theme depending on the season. Spring and Summer typically have events that are beneficial, while Fall will have more obstacles and difficulties. Winter will have negative events but can also have events which allow a player to gain dragon runes through bids for influence. As mentioned, the game is all about gaining dragon runes. 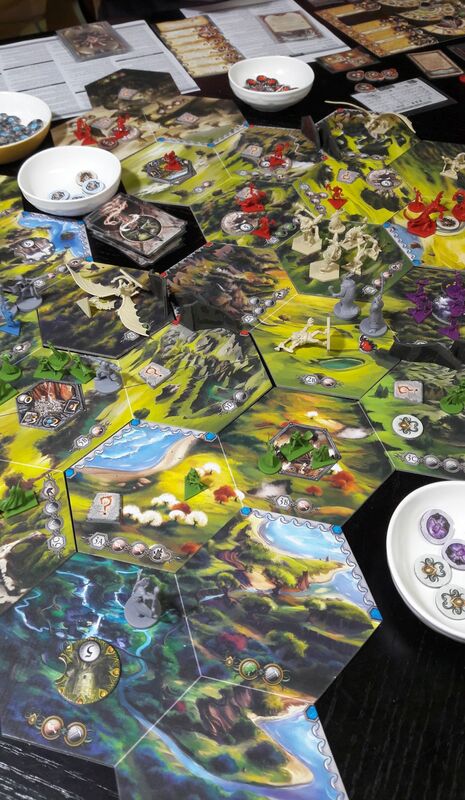 When players set up the board, different tiles of various terrain hexes are placed together. Then players decide their home realms and place one dragon rune, along with a blank rune counter just outside their homelands. If a player moves one of their units into a land containing a rune, they can look at it. If it’s a rune token they secretly tally that to their total. If an opposing player attacks and controls the area, they control the rune token. The tokens can be shifted around as an action, including adding a blank token. Essentially you end up with a large shell game of rune tokens and dummy counters being scattered among the map. Aside from huge armies, players can control up to 3 heroes. During the summer season these heroes can undertake quests offering a chance to earn rune tokens as rewards. They can also skirt through enemy territory acting as a scout, effectively snooping through rune tokens (learning which ones are dummy counters and which ones are the real thing), but watch out! While they can slip through enemy territory, opposing heroes can duel them in the summer season too, gaining all their rewards if they vanquish them in one-on-one combat. What stands out for Runewars is the order system. All players have identical sets of cards representing various commands they can give to their troops, and each order has a numerical rank. Every season a player chooses one order that all of his troops can undertake for the season. The orders for the turn resolve from the lowest numbered command up in numerical order. If values of command orders are tied, the player with the highest influence (or if needed the most starting influence based on their race) acts first. Essentially there is always a set order for how commands resolve during a season. This makes commanding your forces a great challenge. You effectively only have 4 ‘moves’ per year. And for many units if they are given a command to essentially attack, they are exhausted for the year. To add some flexibility to the order system, each command has an additional superiority bonus, or an extra order that can be given to your units during a season. The superiority bonus only takes effect if the value of the order is currently the highest among the other commands you’ve given during the year (ignoring opponent’s orders). Most attack and maneuver orders are lower in value and commands to gain resources, build defenses, and recruit troops are higher in value. As you have tight limits on the number of commands you can give each turn, you really want to plan out the year so that each order played as the seasons progress have a higher value than the previous season commands. Another interesting bit is that the spring of each year will always get a superiority bonus. As there are no other orders played, it will always have the highest value of command orders. This part of the game really shines. You can quickly amass large armies, but to maneuver them year after year gets unwieldy. Every time an army moves into an area containing a neutral or enemy unit, it stops the movement of the troops for the season. You cannot rapidly advance them across the board and have to slowly trundle them forward in short jaunts. This makes planning out attacks and movement to cut off avenues of attack important. You are constantly trying to ensure the current order has the highest command value compared to other played orders, so that you can gain those important bonus actions. It really is an enjoyable strategic part of the game. Resources and recruitment of units are managed by special player boards. Resources are split between wood, ore, and food. Each are a track of numbers recorded using dials. When players give a harvest command order, they will gain all the resources their dial is set at, including all the units below it. In addition players have influence and tactical cards which are special resources. Influence is essentially a currency resource used for bidding on special titles and other seasonal events. Many of these titles are paths to gaining dragon runes. Tactical cards are special bonuses and events that players can use to gain an advantage during combat, allow units to cross seemingly impassable mountain territories, or force a player to reduce their resource dials. Both tactical cards and influence can swing events to their fortune, adding a little unpredictability to the game. Combat is a little unusual from what you might expect from this type of game. Instead of rolling buckets of dice, it is card driven. When units move into an area containing enemy troops or neutral forces, a battle ensues. All the unit pieces are removed and placed on their player board (or on a neutral player board for non-player forces). All units have an initiative order and are represented by a base symbol. Units of higher initiative resolve their actions first. Players draw a number of cards equal to the number of particular units in the battle and resolve them simultaneously for that initiative round. The battle round is determined by the base symbol of the unit and matching results on the card. Each card has four outcomes for all four unit base types. There may be no effect, a rout result causing it to drop out of the battle, inflict a wound, or possibly execute a special attack. The distribution of the outcomes vary depending on the base symbol of the unit. Units that have a higher initiative and attack in earlier rounds of combat will have less of a chance to damage units outright. Conversely, lumbering units of slow initiative will attack in later rounds, but have more card results that match their base symbol. After each unit has a chance to attack (provided they weren’t eliminated or routed in earlier initiative rounds), players total the number of standing units. The player with the highest total of standing forces wins the battle, with ties going to the attacker. The loser has their forces retreat to a friendly or unoccupied area and all of their forces are routed. They will recover automatically at the beginning of the next year, but are essentially out of action for the remainder of the current year. Further if they are attacked again, they are helpless (a player can’t draw cards for routed units). Lastly, if forced to retreat and there are no adjacent areas that are empty or have friendly units, the entire force is eliminated. The combat resolves relatively quickly and composition of forces have some bearing on the battle. A player doesn’t necessarily have to fight neutral units when they are in the same hex. They might be willing to be recruited into a player’s army through diplomacy, but is difficult to pull off. Players draw cards (the same used for battles) which have additional icons to represent 3 outcomes. The card number is based on the amount of influence spent, and the player chooses one card to resolve the diplomacy action. A precious few cards will mean the diplomacy attempt is successful, while others can cause neutral units to retreat. However most will result in a combat breaking out. Diplomacy is risky but many neutral units are very powerful and can be a huge boon if a player can sway them to fight under their banner. In addition to building up armies, players can take control of cities and build up strongholds. Cities are important for gaining resources while strongholds are key for recruiting new forces. Given that movement is so limited, being able to muster new forces closer to your fronts is important. The Good – Runewars is an epic wargame that requires strategic planning. How orders are executed make the game for me. You have a limited number of orders to issue over the game, and need to judiciously deal them out over the seasons. The hero mini-game is also an enjoyable addition which adds some story moments to what could be considered a cut and dried wargame of armies clashing. The random events of the seasons as well as the layout of the board adds replay to the game. I also appreciate that each army has a particular flavor and unit abilities, giving each a certain feel when you command them. This also opens up the means to try different strategies but up to a point. Clearly some armies are better at hoarding tactic cards or wielding influence over others. It doesn’t mean you can’t dabble in these options, but you’ll likely not be a natural fit compared to some other races. The components are solid. The rulebook is well written. The art is well done and a ton of well sculpted plastic bits. It really does capture that feeling of seeing huge forces sweep across the landscape. The Bad – Movement is not dynamic and may not mimic the grand sweeping hordes of what people would expect from a game like this. Battle resolution is also something people might not enjoy with the cards and trying to computate outcomes can be murky compared to rolling dice. The hero turn interspaced in the game can at times be jarring and breaks up the flow of play some. Lastly, the game can suffer from a kingmaker syndrome while poor opening seasons can cripple a player (essentially trying to claw out of a hole and get a shot at victory almost impossible). There aren’t many opportunities for actions and losing one season can result in a chain of disasters. Also the game can be long. Not Twilight Imperium long however getting new players up on the rules will take time which dampers the amount you’d realistically get this to the table. The Verdict – I really enjoy this game. Runewars has a sweeping, epic feel. The season events and tactic cards throw just the right amount of wrenches into player’s plans. There is a thrill to taking advantage of a temporary boon, or thwarting an enemy’s attack. It allows for those peaks and valleys in the play experience that you might not typically see in other games of this kind. Each season you have to make difficult choices. You are constantly balancing the plodding movement of forces across territories, with the end of season culling due to lack of food in the winter. You want to gather up huge forces to ensure victories, but then must be ready to scatter them before winter. Yes you can replenish forces, but it takes time which you never seem to have enough of as there are precious few orders you can give during each year. This isn’t a game you are going to get to the table much. It easily will take up most of your afternoon. However it does provide a foundation to have grand, sweeping fantasy battles where you muster huge armies and have them clash against your opponents. I love how it’s all about securing dragon runes. It can lead to some swings of fate but it doesn’t just reward the person that has the most optimized kingdom engine, but instead rewards risks and subterfuge. Runewars isn’t for everyone. But if you want a sprawling, epic wargame with a fantasy theme, you certainly won’t be disappointed with this game.